The Old Monastery Hostel opened in 1990 and since that time has built up a well deserved reputation for warmth and hospitality. The owner, Stephen Gannon, has created a relaxed and cosy atmosphere in a rambling country house originally built by Quakers in the 1840’s. A collection of artworks created by guests adorns the hallway; the spacious self catering kitchen adjoins a comfortable living room with couches beside the open fire for cuddling up on, candles on the mantelpiece and a majestic view over the village of Letterfrack towards Tully Mountain and out across the sea to Inish Bofin. There is plenty of space for relaxing at the hostel, including alfresco dining areas and lounges to flop into after a fabulous day exploring the surrounding area. Open fires, gentle music and brimming bookshelves adorn the quirky bathrooms to make brushing your teeth all that much more fun. The spacious bedrooms, lovingly decorated in different themes; the Tuscan suite, the African room, the Caribbean room, the Church room and the Connemara Dreamtime suite are welcome places to curl up with a good book, write postcards to friends or even fall asleep to the gentle sound of the nearby stream. The camping area in the front garden overlooks the lush Ellis Wood on one side and the bays and inlets of the area on the other. 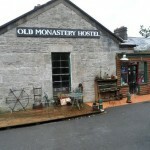 The Monastery Hostel cafe provides sumptuous feasts of hearty, home style country cooking. Treat yourself to a three course candlelit dinner in our ambient dining room for only €10.00 for residents. A free breakfast of freshly baked bread, scones, cereal and tea and coffee is served every morning beside an open fire. 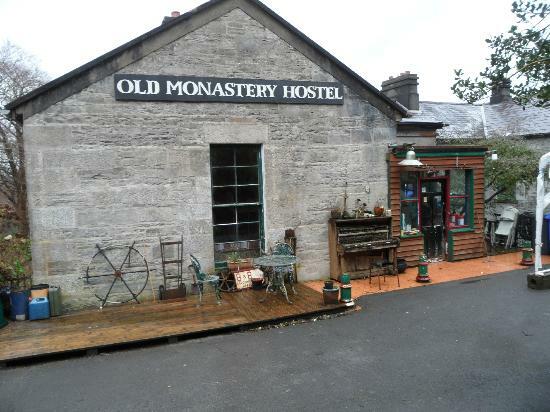 The Old Monastery Hostel is located in the heart of North Connemara and is the perfect base from which to explore the surrounding area whether you enjoy walking, cycling, boating or just relaxing by the fireside with a good book. We invite you to come and stay with us to make your holiday in Connemara an enjoyable and memorable experience.